Robert Detman has published fiction and reviews in numerous journals, with recent work in Akashic Books and the Antioch Review. 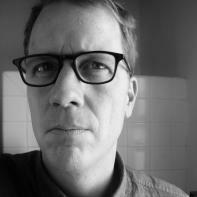 His short story collection was a semifinalist for the 2013 Hudson Prize from Black Lawrence Press, and he is the author of the novel Impossible Lives of Basher Thomas (Figureground Press 2014). Drifting into the deeper, open water, I hear behind me the rhythmic plash as Lindsay rows. I acknowledge her when I look back, but she is as ever cool with me. She’s as rigid as a guard in her yellow slicker, with the tenuous balance of one unaccustomed to the jerky movement of the kayak in rough water. She lets me guide us as I did when Jacob sat there last year. I think of this as a peace she is making with Jacob’s absence. Being out here has dredged up all the elliptical gestures we have used to avoid talking about the future. She hasn’t spoken a lot to me, lately, beyond the day to day contingencies. Here of all places, silence is a tactic that can mean entire catalogs of mystery. At least I know, she’s with me on this trip. I didn’t know how much time we would need before we returned here and even now I don’t know if we are ready. I’d practically grown up here, spending weekends when I was young, camping and kayaking with my father, and I wanted to pass this appreciation for the outdoors on to my son. I look at this return here with Lindsay--without Jacob--as an attempt to make a new start. Lindsay wanted me to show her where Jacob and I went in the kayak. Getting there is making her as uneasy as she was last summer, when she struggled along the channel in the single kayak, waiting for us to return from our excursion around the bay. Jacob and I took the double out for nearly four hours then. Lindsay said she would just practice in the single around the winding channel, staying close to the launch. When she got tangled up in the mangroves, she complained to me later while Jacob was asleep, indirectly accusing us of abandoning her. I’d made the mistake of telling her that we would be right back. But of course, Jacob and I were having a time of it, and he asked if we could go farther out into the bay. Two hours in, we were rounding the point. I suggested Jacob go to sleep away camp. Lindsay didn’t want him to go; I said it would be character building. They believed they had put out the fire as soon as they had discovered it--thought to have been set by some of the boys to some old wall insulation, an innocent prank, a miscalculation--no one considered that it would smolder in the wall and fill the cabin with toxic fumes. The camp guide, Mr. Wexler, told us that Jacob had been asleep--as all of the boys in that cabin were asleep. In the late dark that night, there was nowhere to move the boys. Once the fire was out, no one thought to suggest that the cabin might not be safe. With the way the events were detailed in the report, I wondered if there was some lazy complicity about not following reasonable safety precautions. Some of the kids had complained of headaches, and when they finally realized why--it was early in the morning--they found Jacob. We should have been notified of the fire, no matter how late it was--wouldn’t this have been a normal procedure? If we had known, we would have come right away to bring him home. But the more we tried to discuss it, valiant attempts at comprehension blew up into useless arguments, as we lacked useful words. For weeks, early on mornings, I would find Lindsay in the kitchen preparing Jacob’s sack lunch. On more occasions than I could count, I would hear her in his bedroom. She was sitting in his closet with her head enshrouded in his clothes. She had spent the afternoon arranging his toys into perfect, militaristic rows. I’d had the single kayak since my bachelor days. When I met Lindsay, I bought the double, hoping to coax her with the fond recollections of my youth. I sometimes fantasized us in that double, leading a row of kayaks, cutting through placid waters, setting out to explore uncharted territory. When I took Jacob out in the kayak, I wondered if he hadn’t been nervous and had never told me. Rather, he seemed eager to experience the open water and see what I had so often talked about. He didn’t look scared heading out to the gulf, though the water was choppy. When he needed to stop, I made sure that we found a clear area to pull the kayak up to the beach. Not without difficulty. Mangrove choked sand bar stretched the length of the shoreline. There were few other options to land. It took awhile, but Jacob wasn’t complaining. He’d found something interesting in the shallows. “Helmets,” he’d said. Jacob then told me that their limbs could grow back when they lose them, and I’d corrected him with certainty. “No honey, you’re thinking of starfish.” It didn’t seem to matter; Jacob was fascinated with his helmets, and happy. He said they were in his book of sea creatures. He thought they were perfect. This surprised and puzzled me and I smiled in amusement. I guide us out of the channel, away from the shoreline, near the route Jacob and I took. We are in the middle of a vast expanse that I like to explore with anyone willing, just as my father had with me. I glance back to check on Lindsay, asking, “Everything okay?” not expecting a reply, only to hear her disarmingly calm voice, “David, it’s fine.” I want to believe her. I want to hear her words and have them apply to everything. The wind is throwing small white caps; though mild, it is steady. The sky is powder blue and infinitely clear. Our path is intersected by sea birds crossing low and against the wind. As I know the open water is unnerving for Lindsay, I wonder how it might have been for Jacob--and if he just never told me. I suspect he would have confided to his mother. He excelled at bravery. My upper body is becoming fatigued, and I wonder if Lindsay is rowing half the time. I catch a glimpse of her when I look at the reflection in my watch. Her paddle rests across the coaming. I jokingly suggest I’ll do all the work. “I’m pulling my weight,” she says, and I sense that she’s drawing some conclusions. A bird unveils wide bright wings and lifts away, surprising me from this reverie, alerting me to what I take for granted. “A great blue heron,” she says. “They look like they’re supposed to fly,” Jacob had said of the horseshoe crabs. I could see where his reference to kites, armored cars, vacuum cleaners, spaceships, all in his child’s world, got conveniently, wonderfully, mashed together. These recollections come back to me now, all the things he and I explored, and there must be as many more that Lindsay experienced with him, an entire other world, our three lives circles of varying circumference, crossing and revealing the Venn diagram of our known world, shared. After our kayak trip, I went to his room looking for the book. Strange to admit this, perhaps, but I’d never given the sea creature book a glance before, but I was curious, as if I needed to verify the things Jacob said. Sure enough, there the book was, within whose pages a finely detailed drawing of a shiny, hard-shelled, horseshoe crab, vaguely looking like a helmet as he’d suggested, Limulus Polyphemus. 400 million years old. Among whose traits is an alien seeming ability to re-grow a lost limb. My dream of leading a pack of kayaks seemed almost certain as of a few years ago. But the present has caught up with us on this trip, in the routines we’ve maintained for so long. It’s in those sack lunches. This past year Lindsay and I were spending less time than ever together. I took on extra projects at work to avoid being at home, and in this way, I stopped thinking about how I would have picked Jacob up from baseball practice or could have been planning a more adventurous kayaking and camping trip for just the two of us. No matter, when I returned home in the evenings, I’d find Lindsay in Jacob’s bedroom arranging his toys. As illogical as her actions were, in a raw moment I finally had to say, “Nothing will bring him back.” I know Lindsay thinks of this as my heartlessness, of my reducing the imponderable into a rationalization, but I’m trying to face reality. When we get to the inlet before the gulf, I show Lindsay where we stopped. If Jacob said anything to her about our excursion, he must have mentioned the horseshoe crabs and that hidden beach. After I begin to angle towards the sand bar, Lindsay taps my shoulder. I have to resist saying, “good question.” I know to ease into her urgency, to not make this turn seem unusual, to just go with it. “This is where we went,” I say. “Jacob had to use the bathroom. I didn’t think he should wait.” I don’t want to emphasize that climbing out of the kayak through the brambles to the mucky sand bar isn’t the ideal way to find a rest stop. He didn’t know what was around us, and neither did I. This will just remind Lindsay of being stuck on her own in the single kayak so far from us last time. After a bit of maneuvering, we glide into the shallow water and I pull the kayak up to a narrow clearing. I hold the stern steady and ask Lindsay if she needs to take a break. “Might as well,” she says. I step in my sandals into the goo to hold the kayak for her, triggering the physical memory of holding it for Jacob. “Hang onto my shoulder,” I say. And gently, her hand grabs hold in a familiar, reassuring way. I try to look into her eyes. She grimaces. Under her foot, a horseshoe crab husk crunches. Until Jacob had pointed them out, I’d almost not noticed them the first time. He’d asked me, “How come we never see live ones?” I didn’t have a good answer. Maybe they died of old age, maybe exposure. I thought these must have needed shelter from the hot sun, sweeping across the mudflats to get back under cover, scurrying to the cold water at the bottom of the bay. Taking the kayak to the open water is often daunting. The current can be strong, and without continuous effort and determination, forward movement can feel dubious. When Lindsay and I go back out, we are fighting the current--what probably couldn’t seem any worse than any other time for someone who’s never tried. The sun bears down though there is an icy tinge to the breeze. I’m relieved that the weather is clear—I don’t recall the chop being any worse with Jacob out here. “He told me he was scared,” she says. I’m not sure if she’s somehow reading my mind, or if she’s talking about us sending him off to camp. “When did he say this?” I ask. I’m reminded when she didn’t want me to teach him how to use a rifle. Another character building exercise, I’d said. To change the subject, I say, “You know, my dad would have made me go in the boat.” I realize my irreverence could be taken as a provocation. To reassure Lindsay, I turn around as if to reason with her. She’s working it out, still. I’m relieved, but also a little uncertain. “It’s not like he died from the fire,” she says, as if to convince herself. The psychologist insisted that Jacob did not suffer--he was asleep. It was as if he never woke up. “Well, if there wasn’t the fire, he would be here now,” I say. My attempt to understand how she is making sense of this is to challenge her conclusion. My words make her taut, unreachable. In spite of this, I catch myself enjoying kayaking again. That night we set up the tent and sit near the fire pit, and I put out the prep for dinner, a routine that comes naturally. Lindsay insisted on these familiar details: that we camp at our favorite site, that we do everything just as we ever would, regardless of what’s past. “I need to know what you’re thinking,” she says. This is the fuel to all of my frustrations. She agreed to come back here this year, too soon. Making a fire--though it never occurs to me to not make a fire--is what we do here. A smaller fire will force us to sit closer, huddled together to keep warm. Still, for a long time we sit around the pit, making no move. The gusts from the wind make it much colder, the breeze from the gulf carries a tinge of winter. We haven’t even begun to gather up tinder, or pulled the logs from the trunk of the car, though a pack of matches sits on the rock at my feet. “Maybe we should skip the fire?” I say, because I’m not sure I can bring myself up to the task. To this Lindsay gets up, impassive as ever. The look on her face reminds me of her stern complicity on the boat, but I’m not sure I’m reading her correctly. In that comfortable space, I remain. I try to imagine if Jacob was here, would it matter, would we ever skip a fire? But what I think of, can almost conjure, is that he is asleep in the three man tent. Lindsay wanders into the dark with the beam from her headlamp growing smaller, swimming around, as she looks for fuel for the fire. I go to the trunk and pull out the bundle of logs, still with their plastic band wrapped taut. I drop them next to the pit with a thump that sounds like a body smacking the ground. Lindsay returns with her arms full. While I go looking for some deadfall, Lindsay arranges the tinder and logs in the pit. I stay back and keep myself busy, resisting the urge to direct. She’s never bothered with making the fire before. “This should be enough to get started,” I say. She begins to make fire, with great deliberation. Somewhere she’s either watched me make fires through the years, or she’s a natural and has never revealed this to me. She strikes a match and deftly tends the small flame into a fire. She moves about with skill, only occasionally looking my way for an answer to the unanswerable questions she’s posed. After our fugitive meal in near silence and darkness--the flickering firelight casts our faces into monochrome gestures, unreadable. Lindsay leans against my arm and holds onto me. In the ruddy firelight, Lindsay pulls away and holds tight to herself. Beyond the crackling fire, in the near distance, I can hear the gulf breaking against the mangroves at the mouth of the bay. I put my arm around her shoulders. She shivers slightly. She wants certainty, doesn’t want dissembling. Ignoring my resistance, just pushing onward, Lindsay says again. Trying as hard as I can, I struggle to remember all the times when we were enough for each other, before Jacob was part of our lives, before any of the past, deceptively difficult, years. Before we knew he was going to come along, before we had a chance to plan. And as painful as the thought is, as hard as it is for me to know with certainty, I say, “I don’t know,” because this is what I believe.